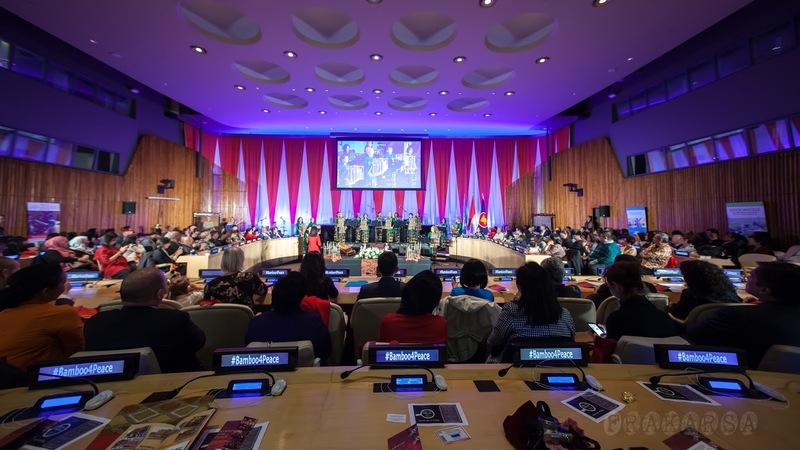 "Excellencies, Distinguished Guests, Ladies and Gentlemen..
Good evening and welcome to BAMBOO FOR PEACE"
It is indeed a great honor for us to welcome you all in this beautiful ECOSOC Chamber at the UN Headquarters. 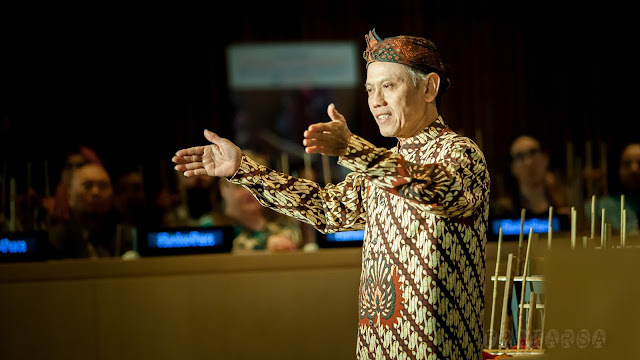 Let's start our beautiful soirée and give a big warm of applause to our one and only, Permanent Representative of the Republic of Indonesia, His Excellency Ambassador Dian Triansyah Djani.."
I was just running from the security gate helping some guests to get in to the UN Headquarters that night just minutes before I opened the event as the Master of Ceremony that night. Good thing I wore my flat shoes, although my Tenun Bali might be screaming as I ran around that night. 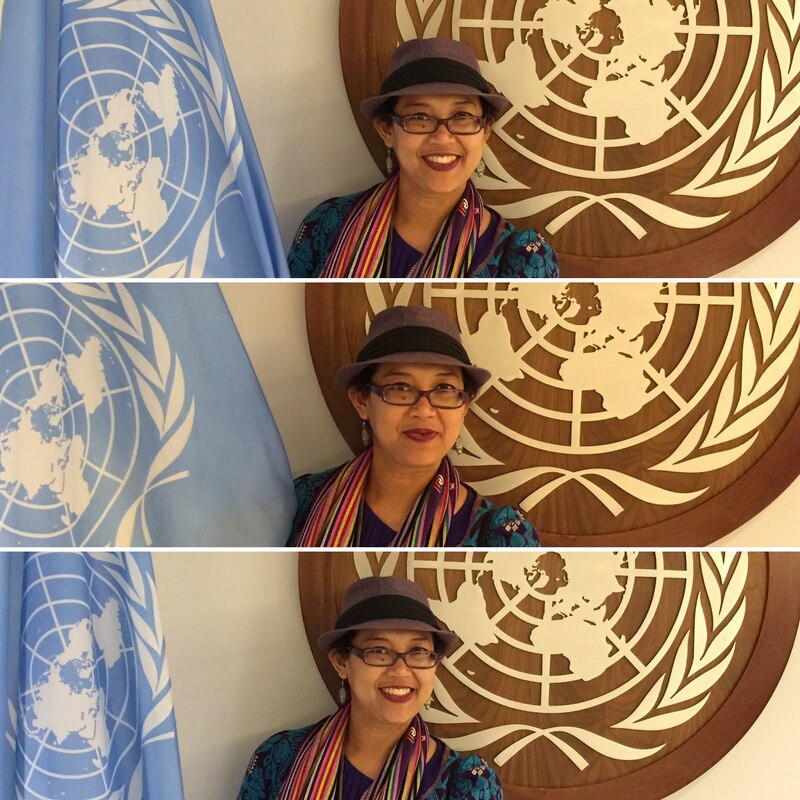 Yet, I was super excited and eagerly welcoming the dignitaries and audience to ECOSOC chamber that night! 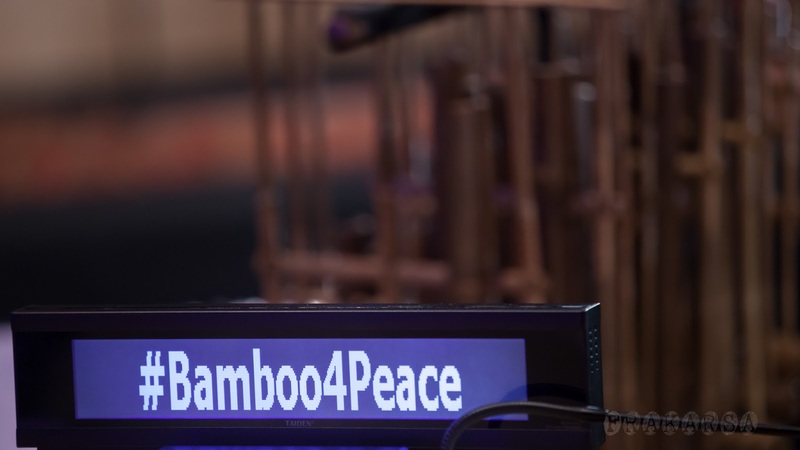 BAMBOO FOR PEACE, an enchanting journey of Indonesian sounds and rhythms, beautifully played in Angklung, a UNESCO Intangible Heritage instrument. 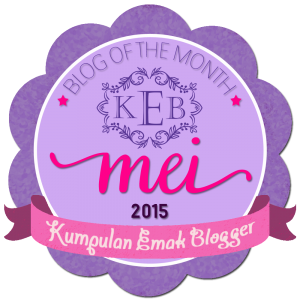 Have you heard Angklung before? Some of you might have heard of it before and even are so familiar with this beautiful traditional musical instrument. 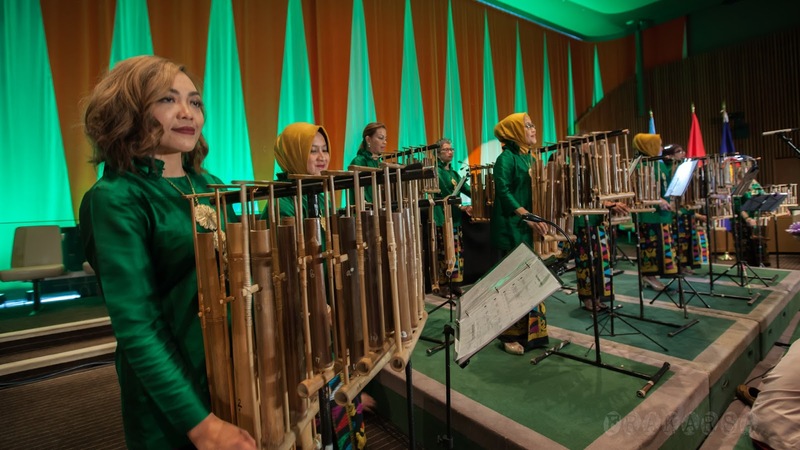 For those who are not familiar with this traditional musical instrument, Angklung is the traditional musical instrument made of bamboo. Those bamboo tubes are hung or suspended in a bamboo frame and bound with rattan cords. Very traditional and environmentally friendly. As I read on the open sources, those bamboo tubes are carefully whittled and cut masterfully by the craftsperson, in order to produce specific sound and tune, with different notes. You play it by shaking it in a certain way so it will sound beautifully. 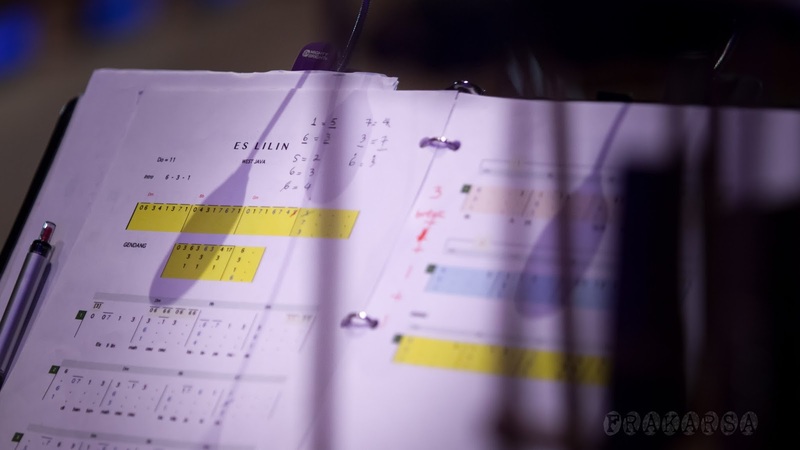 You need to play a complete set of angklung in order to play the complete song or arrangement. That's why Angklung is resembling important values of teamwork, mutual respect and social harmony. Isn't it beautiful! 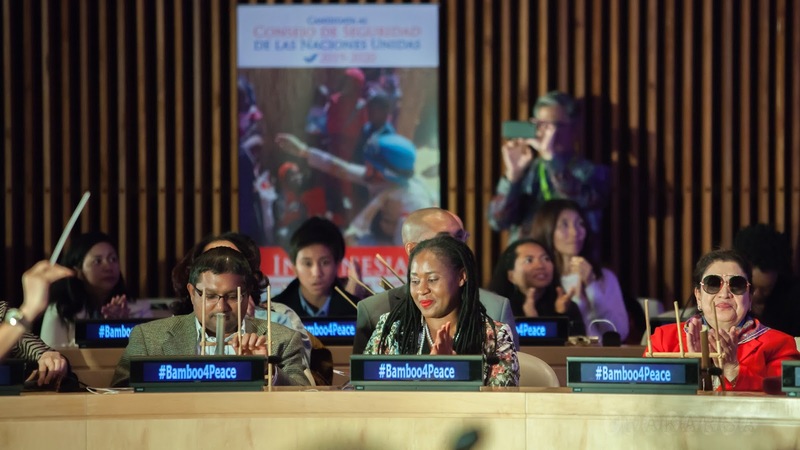 We just had an event of BAMBOO FOR PEACE, to celebrate the World day for Cultural Diversity for Dialogue and Development. 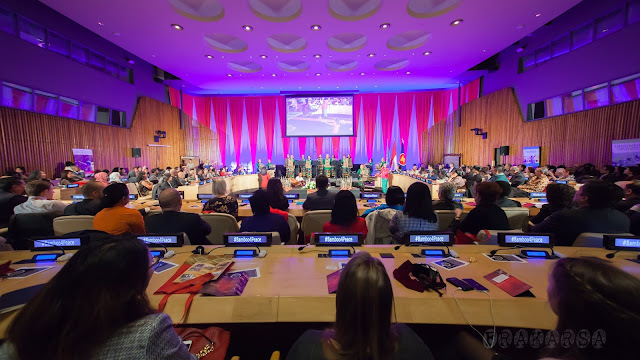 It was held in ECOSOC Chamber on Monday, April 30th, 2018. 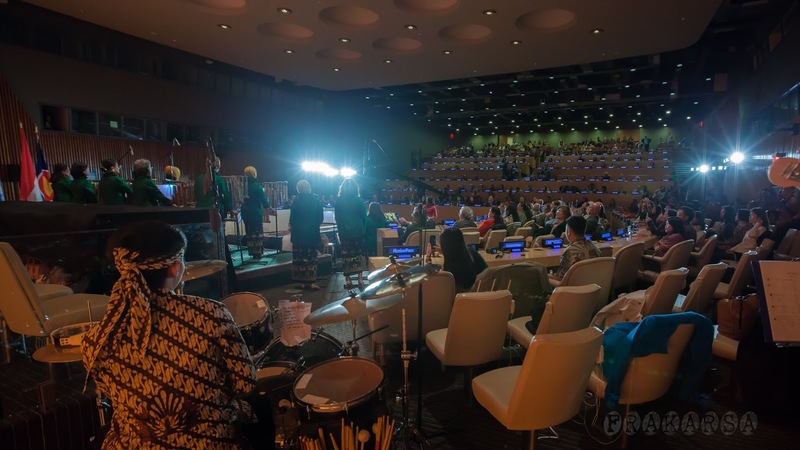 The first time ever Angklung is played at the United Nations Headquarters! 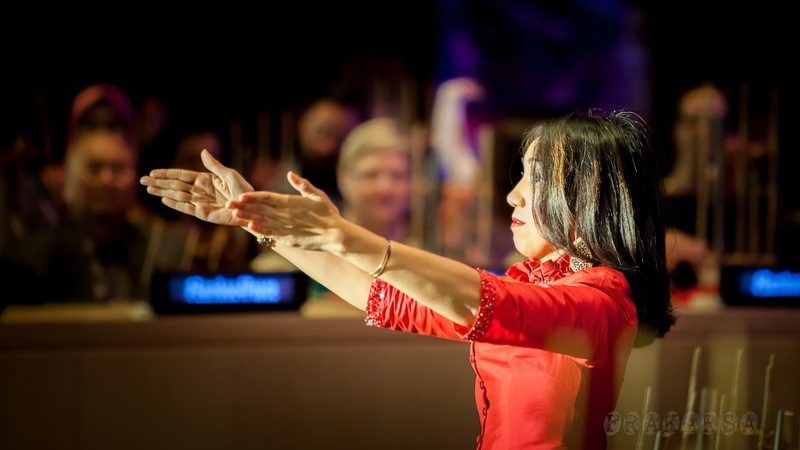 We brought an angklung orchestra from House of Angklung in Washington D.C and the Angklung Master from Saung Angklung Kang Udjo, Bandung, as well as the dancers from Jugala Taya. 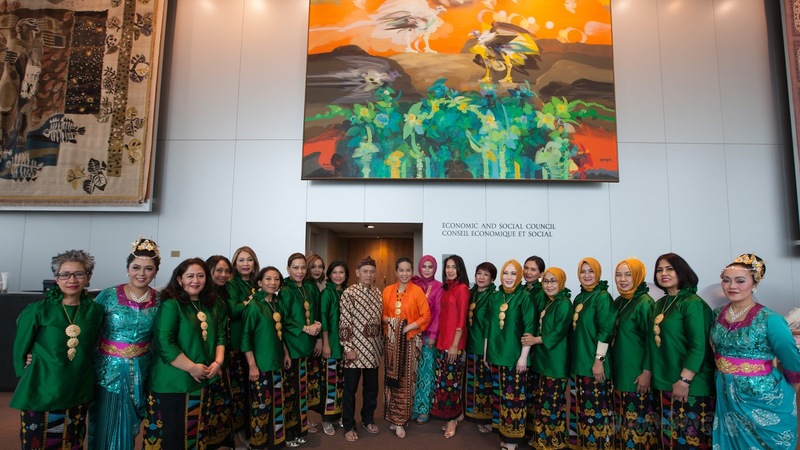 The event was also sponsored by the Ministry of the Foreign Affairs and the Ministry of Tourism of Indonesia, as well as our Embassy in Washington D.C.
We had a full house that night! 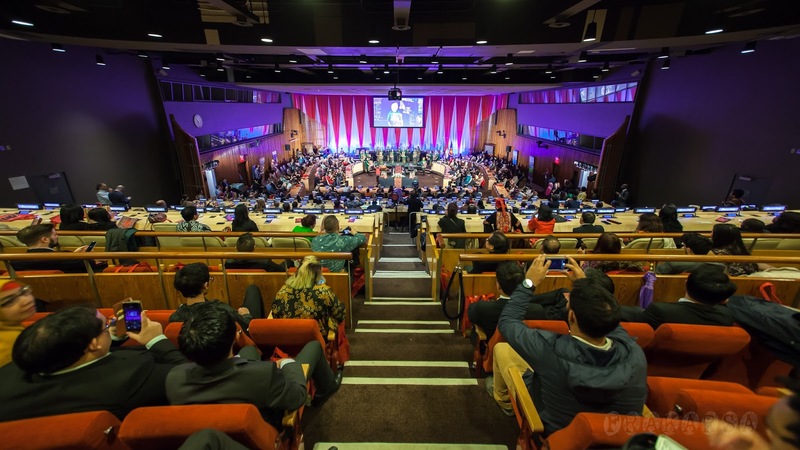 More than 500 seats at the ECOSOC Chamber was occupied! 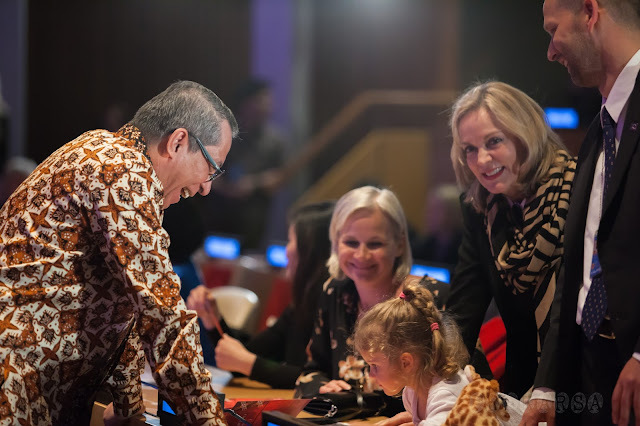 As we opened the event, my Ambassador gave a brief welcoming remarks and highlighted the beauty of Angling, as well as the message of peace, beauty of friendship and engaged cooperation and partnership. 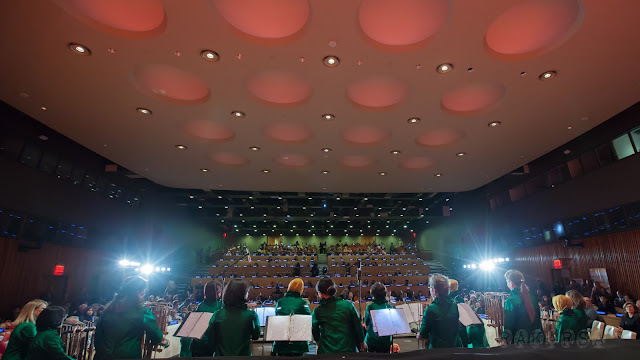 Then the Orchestra played Blue Danube by Johan Strauss as the opening. Those beautiful melodies sound so familiar I believe everyone enjoyed it. After that, a medley of Indonesia traditional songs were played. Bungong Jeumpa from Aceh, Gethuk from West Java, and Yamko Rambe Yamko were so fun! Then we had another Indonesian traditional song, Es Lilin, from West Java, before New York New York from Frank Sinatra beautifully filled the chamber and people sang along with it! It was a full house indeed! 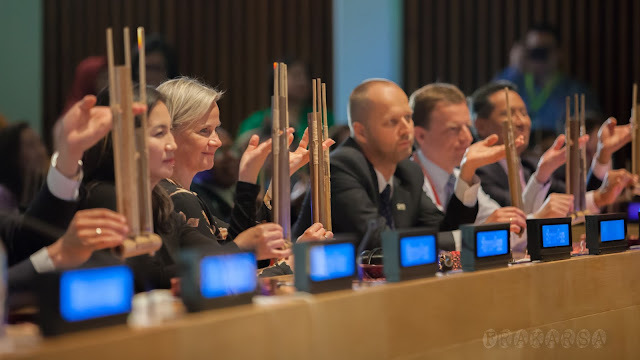 So proud to hear the beautiful melody of Angklung being played for the first time in the UN Chamber! And I can say the ambassadors and all our distinguished guests were enjoying the interactive session of Angling! And we also had the interactive session, when each audience was given one's own angling to play. And we played it all together! Lullaby, Can't Help Falling in Love from Elvis Presley, kakatua and We Are the Works from Michael Jackson, played together with the audience during the interactive session. I will certainly be back with more photos and stories on these lovely event! And thank you to my hubby for all these wonderful photos :). So, do you like traditional musical instruments? Do you think you will love Angklung too? Awesome! Keren banget udah kebayang gimana meriah dan bangganya. You're so fab! Kece jadi MC of the day. 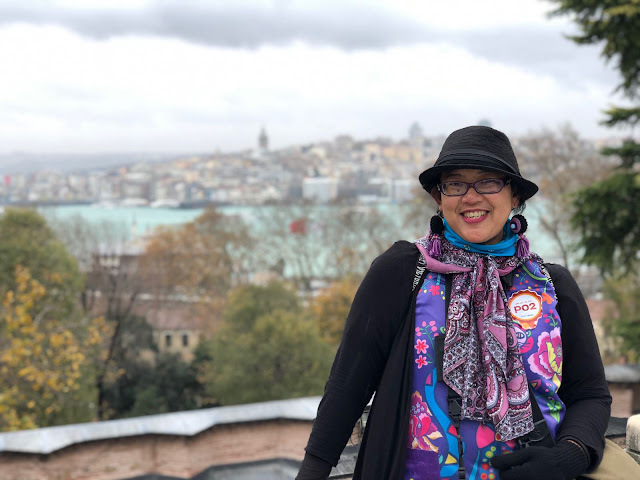 Keren Mbak Indah. Senang melihat angklung ada di sana. I have never heard Angklung being played before, but seeing the smiles on everyone's faces in your photos, I am sure it was played beautifully. Iyaaa bener.. soalnya cakep bangeeet kalau dimainkan sama-sama mba! Kita semua wajib mencintai dan ikut mengenalkan budaya seni lokal agar makin dikenal di banyak negara. Happy to see you enjoy it! Wah..bangga banget ya, angklung dimainkan ama bule2 sana. Saatnya lebih menduniakan angklung ya mba. Di Indonesia, jarang yang main angklung. Dan di luar negri justru dengan bangga di perkenalkan. 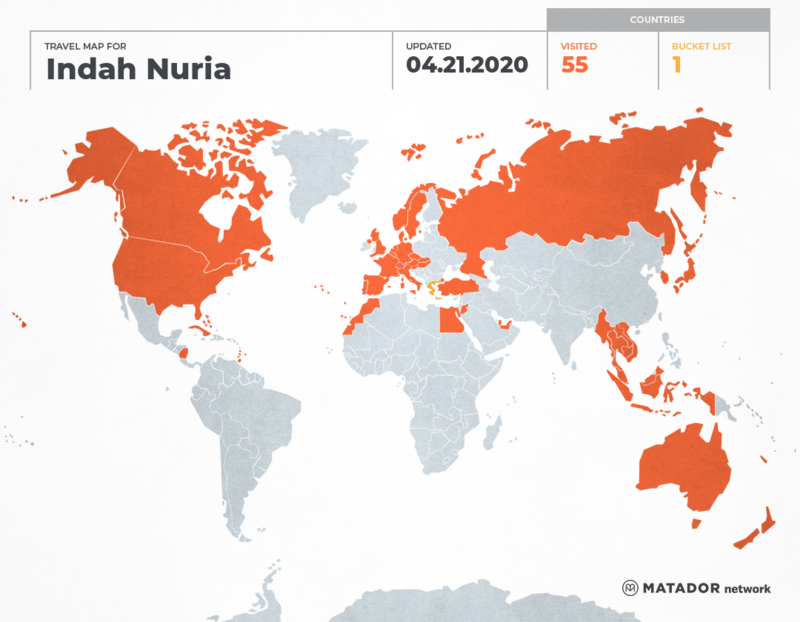 Indonesia harus bangga nih, seatnya full dan yang didendangkan lagu daerah Indonesia. Bangga deh! Betul! Itu orang sampai berdiri di sisi kanan kiri untuk nonton! Bangga banget niih...salah satu alat musik Indonesia bisa mendunia. Meskipun saya bukan orang Sunda, tapi saat ini sedang menjejak di Bandung. Mbak, ada videonya di Youtube gak sih? 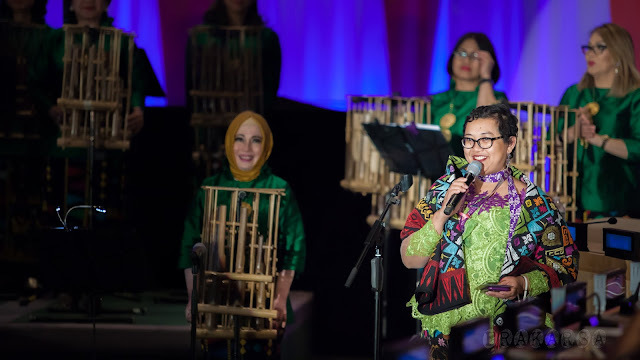 Mau dengar New York New York pakai angklung. So proud of this local musical instrument. ayooo belajar lagi mba..seru lho! Pastinya sangat bangga ya mendengar angklung ada di negeri orang lain, hiks..terharuu euy..
Kalo angklung belum pernah liat pagelaran di luar negeri, baru di tulisan mba Indah ini deh. 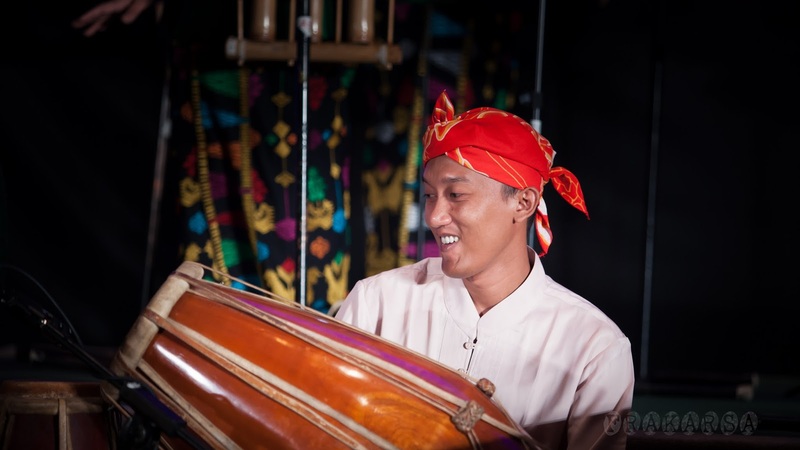 Sebelumnya aku pernah liat pertunjukkan gamelan yang semuanya orang bule, pakai segala asesoris pakaian Jawa pula. So proud angklung bisa go internasional juga! What a nice way to let people know more about our culture, more positive news from Indonesia!